As you probably know, we closed an agreement with Mike Labelle, professional FIFA player for the New York Red Bulls. He has won seven national titles in a career that spans the past ten years. He is also an influential content creator, boasting over 280,000 subscribers on YouTube and over 70,000 followers on Twitch. He will explain everything you need to know to improve your FIFA skills. Today, he will introduce you to the new feature time finishing for FIFA 19. Don’t forget to support Mike, by subscribing to his YouTube channel and by following him on Twitter. More gameplay guides for FIFA 19 will be published, so don’t forget to come back and learn with the best. The Timed Finishing feature is a new technique in FIFA 19 that is executed by pressing B twice (the low driven shot, which used those buttons in the past, is now LB+RB+B). You need to time your second B tap perfectly to pull off a perfectly timed Timed Finish. Pressing it too early or too late will result in a weak and misplaced shot. EA has claimed that a well-executed Timed Finish will result in a shot that is both more powerful and more accurate; however, it seems as though it only really provides a significant power boost in game, as shots taken from around the same region on the pitch that weren’t Timed Finishes seemed to be just as accurate. What’s good about Timed Finishing is that it allows players to execute shots that they might not be able to pull off with just a regular shot. However, it’s only really worth using a Timed Finish shot on volleys and longshot attempts, because those shots are hard to execute normally and so your risk vs. reward comparison pays off. There’s not much point attempting a Timed Finish shot on finesse shots or when you’re 1v1 against the goalkeeper, because it could overcomplicate a finesse shot and makes it much more likely that you’ll fail to score a chance that you should otherwise be finishing without any difficulty. The real challenge of utilizing Timed Finishing is evaluating what I mentioned earlier, the risk vs. reward equation. Timed Finishing will increase the skill gap between average players and elite/pro players, but the fact that it’s so tricky to master means that, inside the box, it’s just not worth taking the risk. Most elite players can finish a chance inside the box without Timed Finishing, and so unless it’s just not worth the risk unless you’re attempting a volley or a longshot. It’s also important to understand that a well-timed Timed Finish is not a guaranteed goal; you will still have to angle your player’s body as you would normally if you want the shot to stay on target. You will also have to learn how certain players approach a shot, as different heights, body types, and techniques will affect how a player strikes a shot, meaning that it also affects when you need to time that second B tap. 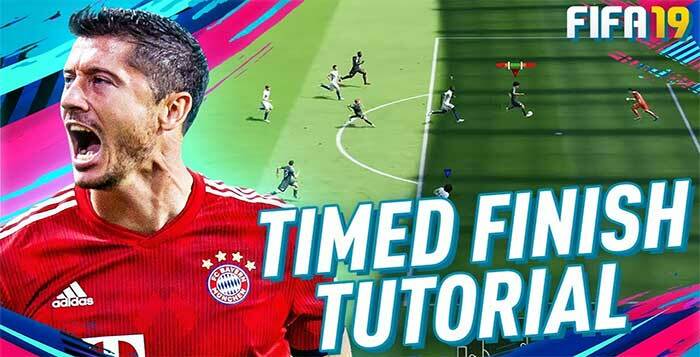 As we start to grind FIFA 19 it’ll become apparent whether or not Timed Finishing will be worth mastering or if it’ll just be turned off by most players, but as it stands right now, Timed Finishing is a rather difficult technique which only results in a very small percentage gain for your shots. Mike Labelle is a professional FIFA player for the New York Red Bulls, and he has won seven national titles in a career that spans the past ten years. He is also an influential content creator, boasting over 280,000 subscribers on YouTube and over 70,000 followers on Twitch. I have some questions about Timed Finishing Shoot. 1. What are the meanings of 5 color on Timed Finishing Shoot; Red, Orange, Yellow, Green, White ? I knew 5 Steps Too Early (Red), Early (Yellow), Great (Green), Late (Yellow), Too Late (Red). But suddenly I found Orange and White. 2. How many steps and colors are on Timed Finishing Shoot like above; Too Early (Red), Early (Yellow), Great (Green), Late (Yellow), Too Late (Red)? 3. When Green light comes out I can feel my pad is vibrating. I am using X BOX ONE S for PC. But sometimes even it shows green my pad is not vibrating. When vibration exactly is working?